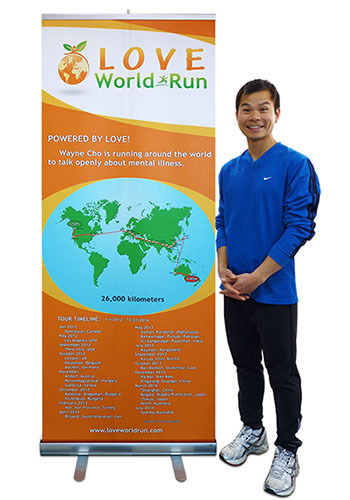 When Wayne Cho decided to raise awareness about mental illness (specifically anxiety and bipolar disorders), he did it with the activity that has helped him get a handle on both in his own life – running. With Love World Run, he completed a 8,200 km run across Canada in 2009, before embarking on a 7,500 km run across the USA that wrapped up in November 2012. Up next – the world. After having completed his cross-country run of the US, he will start up again in London, England and make his way to Sydney, Australia. We made this custom retractable banner for him to show our support for his cause, and we wish him the best of luck in reaching his ambitious goal!